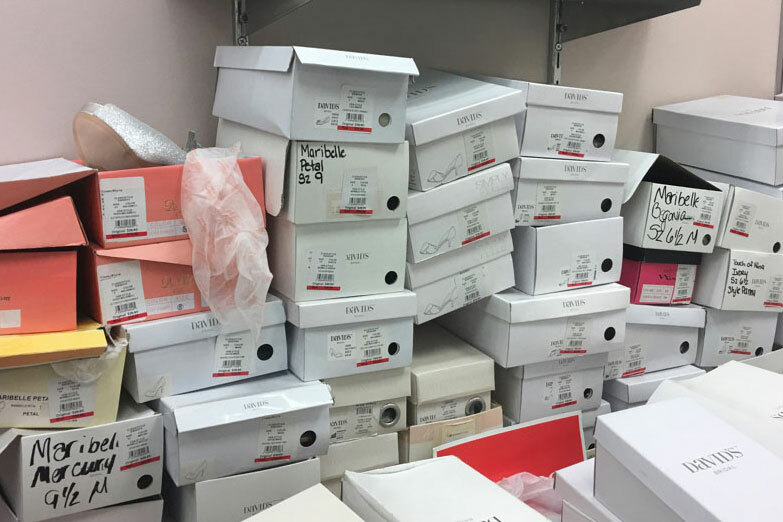 Refresh David’s Bridal's failing retail experience. Brides-to-be are looking for a "Say Yes to the Dress" experience. Unfortunately for David’s Bridal, that's everything they're not. The dress shopping experience is the beginning of a larger emotional memory, and the dress lives beyond the wedding day. We’re not dressing you for a day, we’re styling you for memories. I conducted a brand audit and identified the problem and opportunity for us to tackle. Then I collaborated with the strategist to research and identify our target and develop a strategy. I also worked with the creative team as needed and provided feedback on creative deliverables. "Every time I changed gowns I stood in front of the whole store in these undergarments. Even if I had changed gowns inside the dressing rooms, all the mirrors were gathered in the center so EVERYONE could see you." "We walked into a mad house. Think: Walmart. Mind you, I don't shop at Walmart for this reason. People everywhere. Disorganization. Cheap products. Just, no." 1. No woman goes dress shopping alone. A dress is a big purchase and requires the consultation of her friends and family. Every member of the party needs to feel valued. 2. The dress makes it real. Putting on "The Dress" is a flood of emotions. Suddenly she can visualize the ceremony and the memories begin at this moment. 3. These are once in a lifetime events. Weddings are joyous and momentous occasions, so why should the dress buying process be any different? The dresses women wear at their weddings live on long past the day they were worn. They are proudly displayed in our homes as some of our most prized photographs, and they live on in our memories of the event – it’s rare that a wedding is brought up without mention of dress. David's Bridal makes each woman feel celebrated. We're not styling you for a day, we're styling you for memories. All of sudden the world becomes a fairy tale, where the birds sing a little louder and the sun shines a bit brighter. You move through this dream with friends and family, all excited for it to become real. Then, one day, it does. The right dress turns fantasy into reality for you and your entire party. You can all see the moment happening right before you, and you know that it will be one you remember forever. At David’s, we know how important the right dress is for every occasion. So we don’t just dress you for the day, we style you for the memories. 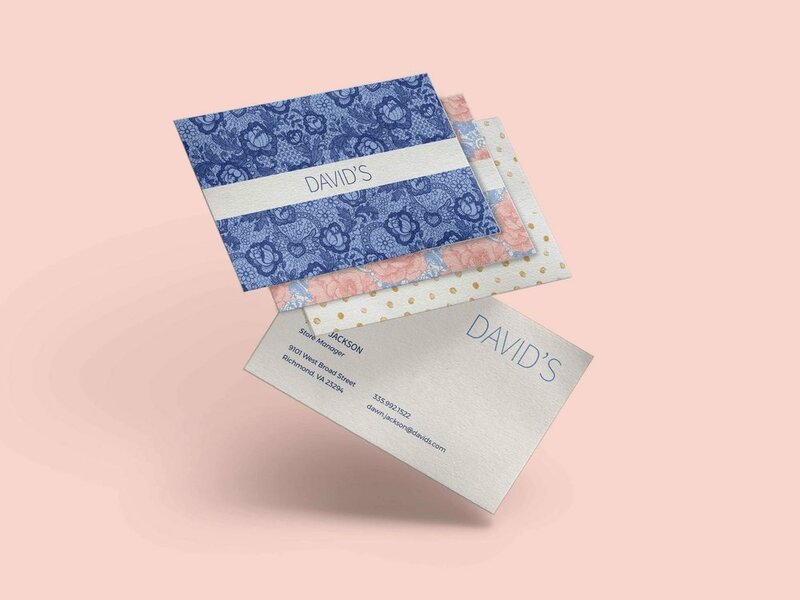 Shortening the name from David’s Bridal to David's creates a more boutique feeling while also reinforcing that David’s is for all of life’s special occasions. A clean, modern look feels elegant, and the use of patterns makes it easy to keep the design fresh across every medium. We created little personalized touch points throughout the store to reinforce that this day is all about the bride and her party. David's is able to use the names from reservation data to create individualized parking, seating, and dressing room signage. Moving all the stock off the floor to the back room eliminates the warehouse feel. Select dresses will be prominently displayed to inspire shoppers, and consultants will take her size straight to the fitting rooms. A wall at the welcome desk creates architectural compression, encouraging interaction with staff and increasing the wow factor of walking into the showroom. We swapped out the open, free-for-all dressing room floor for these much more private areas. 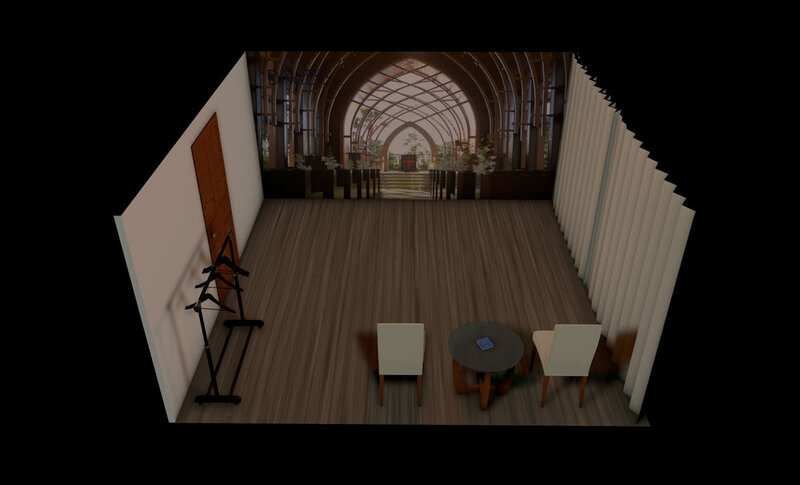 Family and friends will now have space to sit and enjoy themselves while the bride-to-be shows off potential dresses. These rooms are fully modular, easily allowing for different-sized parties. 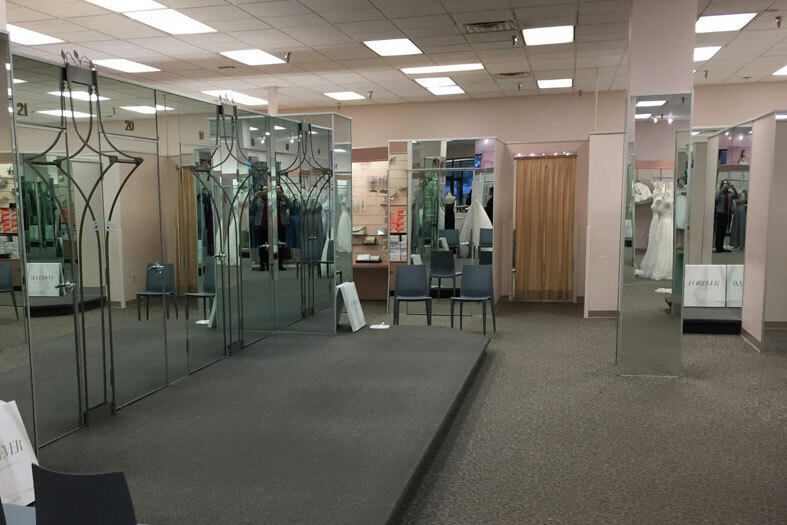 Each dressing room has a door that leads to the back of the store allowing consultants to privately provide dresses to try on. Our focus on personalization continues with projectors and lighting that let each woman visualize the environment that their dress will be worn in. 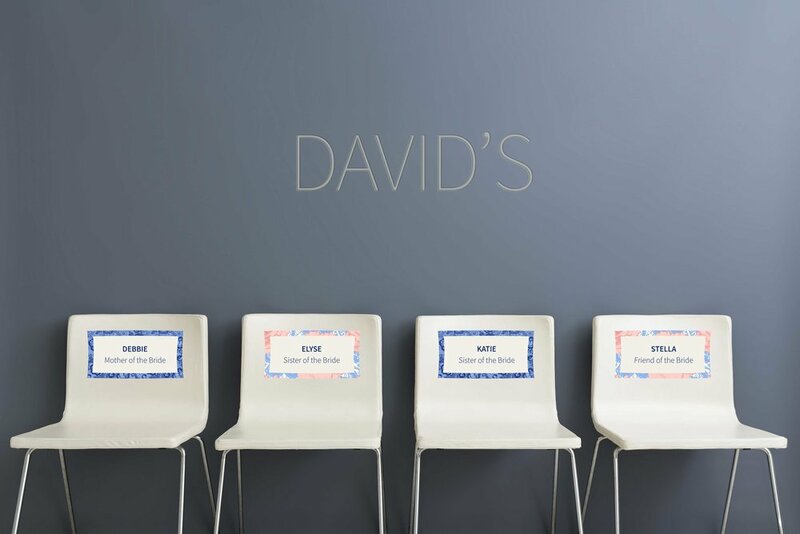 We wanted to create ways for people to share the memories they make at David's, so we redesigned the store with Instagram-worthy backdrops throughout. These encourage customers to take their own pictures that are easily sharable on social media. After the visit, a personalized card will be sent to her adding a special, elevated touch.